Yes, yes, YES! I am so, so glad you enjoyed this, Keertana! I agree that Frankie is refreshing but yes she was a certain type of girl and there are a series of videos of authors discussing this book - I'll find the link - I haven't watched them all but they're good. Also, I love that you could personally connect via your experiences. All girls and women should feel equal, hopefully one day is the case. Hmmm. I'm curious about this one Keertana! It's always nice when you can relate to a narrator and that your own life experiences provide the thread to help link you together, but I'm not sure about the narration wherein Frankie talks to the reader. I haven't actually read a book like that so I don't know how I'll react to it, it may not bother me at all. I definitely want to find out though:) Love that Frankie is a strong female lead too, no relying on men for her. WIN! I've heard so many good things about this one! I tried to get it on audiobook, but the tracks were all about 10 seconds long, which made my iPhone freak out...I digress. Thanks! (: I hope you have a nice day too! Thanks Hilda! LOL! Yes, I became a feminist quite young, didn't I? I really liked this book, so I hope you get a chance to read it soon! It's amazing! I enjoyed this book so much. As you said, not perfect but I loved the ideas and the 'girl power' aspect of the story. Great review! 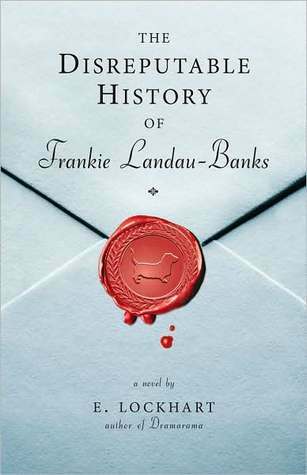 I've heard many good things about E. Lockhart and her books, specifically The Disreputable History of Frankie Landeu-Banks. I agree with you that there are tons of stories out there with females who need to be rescued. But there are also tons of stories where females don't need to be rescued because their strength lies in a physical weapon. Frankie doesn't sound like either of those types, so I'm curious to read about her strengths. And, yes, who doesn't want to read something that shows how awesome women can be? I think this is such an interesting and insightful review! I started this book, was REALLY enjoying it, but then I made the mistake of flipping to the end and lost my desire to finish it. Everyone raves about this though so I want to give this another shot! I especially liked what you said about relating to Frankie and the issues you brought about 'types'. I listened to this one on audio and I really struggled with Frankie's voice. I see where you're coming from and why you felt so strongly about it, but I got stuck at her being a type, just like you pointed out, and I felt that her behavior was pretty exaggerated. I do recognize the quality of Lockhart's work, and I ended up giving it three stars, I think.